These objectives are realized through various projects under the guidance and supervision of the NSS Programme Officer assisted by faculty members. 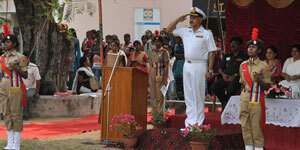 The NCC plays an important role in moulding the character of young women. It develops leadership qualities among the cadets and inculcates the spirit of sportsmanship in them. To develop qualities of courage, comradeship, discipline, leadership, secular outlook, spirit of adventure, sportsmanship and the ideal of selfless service among youth to make them useful citizens. To create a human resource of organized, trained, and motivated youth, to provide leadership in all walks of life including the armed forces which will be always be available for the service of the nation.